The last of the season’s Formula One races is the Brazilian Grand Prix, taking place at Interlagos. A Brazilian Grand Prix was first held at Interlagos in 1972, although it was not part of the Formula One World Championship, only being included in the official calendar the following year. In 1978 the Brazilian Grand Prix moved to Jacarepaguá in Rio de Janeiro, briefly returning to Interlagos for the next two seasons before returning to Rio in 1981, due to safety concerns with the 5-mile Interlagos circuit. In 1990 the Grand Prix returned to a shortened Interlagos, where it has stayed ever since. Motor racing started in France, and the first race, organized by Le Petit Journal, a Parisian newspaper, took place on July 22, 1894. It was run over an eighty mile (128 km) course between Paris and Rouen. Count Jules-Albert de Dion was first into Rouen after 6 hours and 48 minutes at an average speed of 19 km/h (12 mph). Compare that to today’s Formula One cars which are considered to be the fastest circuit-racing cars in the world, owing to very high cornering speeds achieved through the generation of large amounts of aerodynamic downforce. Formula One cars race at speeds of up to 360 km/h (220 mph). In South America, apart from a few privately held races at the end of the 19th century, official racing started in 1906, with a race organized by the Automobile Club of Argentina, from Buenos Aires to El Tigre and back. In Brazil, the first official race, organized by the Automóvel Club de São Paulo – took place on July 26, 1908, in Itapecerica da Serra – São Paulo, the winner being Sylvio Álvares Penteado, driving a 40hp Fiat. The borough of Gávea in Rio is today best known as the home of the PUC University campus, Parque da Cidade, the first Shopping Mall in Rio, ‘Baixo Gávea’ where the chope flows and the streets are jammed certain nights of the week, and for being near the Jockey Club, Jardim Botanico and the Flamengo Football Club, which although nearer to Leblon is cited as the ‘Gávea headquarters’ of the club. 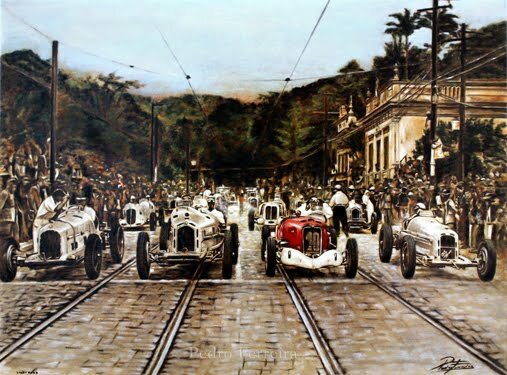 Things were different back in the 30s, when the streets of Gávea were more likely to be jammed with motor racing fans. From 1933 to 1954, racecars (nicknamed in those days as ‘baratinhas’) from famous ‘scuderias’ such as Maserati, Ford, Alfa Romeo, Bugatti, Allard and even Ferrari raced around the ‘Circuito da Gavea’, where the Grand Prix was held 16 times, revealing drivers such as Chico Landi, Manuel de Teffé and Pinheiro Pires, and also attracting foreign drivers – in particular Juan Manuel Fangio – who raced in 1952, soon after his first Formula One title, but was beaten by Landi. In Rio, in the late ’20s and early ’30s, the first races were held on the Gávea circuit. Things really got going in the 30s, and some years later, after manufacturers such as Ford and General Motors started up in Brazil, competitions became more common. Some of them, such as the Petropólis Mountain Climb, attracted foreign competitors. Manuel de Teffé, a Brazilian driver who had had some success in Europe, returned to Brazil with the idea of starting motor races here of international interest. His idea was taken to President Getúlio Vargas, who promised to support the sport. In 1933, the Automóvel Club do Brasil organized the “1st Rio de Janeiro Grand Prix “, on Sunday October 1, over the “Circuito da Gávea”. The Automóvel Club do Brasil (ACB) then applied to the International Automobile Federation for the right to host a race as part of the Federation’s official calendar. The application was accepted, and the Rio Grand Prix, raced over the Circuito da Gávea, became official. The Gávea circuit consisted of over 11 kilometers of various types of road surface – asphalt, concrete, cobbles and sand – with inclines and declines and over 100 curves in its route around the Pedra da Gávea. The start and finish were in the Rua Marquês de São Vicente, almost in front of the old headquarters of the ACB, and one of the early challenges in the race were the tram tracks, a major means of transport in those days. The circuit then followed Avenidas Bartolomeu Mitre, Visconde de Albuquerque, Niemeyer and Estrada da Gávea, which today runs through the Rocinha ‘favela’. The cars climbed to the top, and then descended back down the Rua Marquês de São Vicente to the finish. The route was fraught with danger, with none of the safety features so common today, and it soon earned the nickname “Trampolim do Diabo” (Devil’s Springboard). Even so the cars managed to attain speeds as high as 250km/h. As the circuit became better known, it attracted more international teams and drivers. The winner of the 1935 Circuito da Gávea was Italian/Argentine mechanic/driver Ricardo Carú, with an adapted Fiat 519. Carú was born in Italy and immigrated to Argentina, where he never won, but often came in second, earning him the nickname “El Eterno Segundo”. His victory in Brazil was the first of his career. The 1936 race attracted some of the European heavyweights. The Ferrari “Scuderia”, which at the time was the competitions division of Alfa Romeo, sent two of its B-team drivers to Rio – Carlo Pintacuda and Attilio Marinoni. Also driving in the race was French female driver Hellé-Nice, who caused an uproar by posing for photos in a two-piece bikini – and smoking – on Copacabana beach. She didn’t finish the race and in the following month suffered a serious accident racing in São Paulo, prematurely ending her driving career.The Italians with their Ferrari were also unlucky, and had to abandon the race with a broken differential, giving first place to Argentine Vittorio Coppoli. Carlo Pintacuda didn’t give up on the Gavea race, and came back to win the following two years.